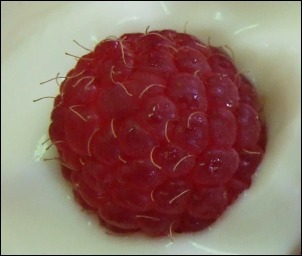 I just love this photo of a raspberry sitting in yogurt, as one can too easily forget how ‘hairy’ raspberries are – LOL! Oh, and now John just emailed me from work saying he got a huge box of strawberries, and I’d better start thinking of ways to eat them! 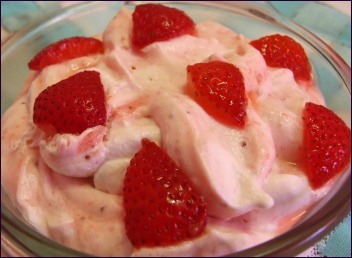 (How about my usual, clean and cut them up, sprinkle a bit of sugar on them, and then just eat ’em til their gone… not very glamourous, but it’s very hard to resist strawberries, especially while you’re trying to think up ways to EAT them in the first place.) 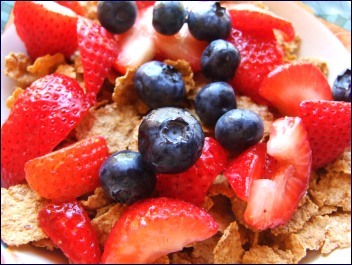 Stay tuned for more strawberry-related posts! I’ve liked having things like Pop Tarts around as backups for times when you run out of milk for cereal, or just want a snack in the afternoon. But at some point (a long time ago now it seems) Kellogg’s Pop Tarts changed their formula – my theory is that they added more high fructose corn syrup and deleted any remaining ACTUAL flavor – resulting in pastries that were hideously sweet yet still alarmingly tasteless. As a result we stopped buying them completely. But this is a story with a happy ending! 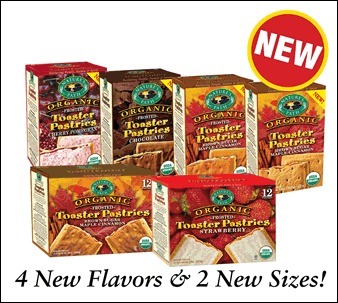 At Trader Joe’s we rediscovered the Toaster Pastry… ORGANIC, FROSTED TOASTER PASTRIES!!! By Nature’s Path. We got blueberry and strawberry, at the same price or even cheaper than a good price for Pop Tarts at the grocery store, and they were delicious! I KNEW they could still make toaster pastries with flavor – LOL – plus all organic ingredients, and no high fructose corn syrup. Yes! So, as you can tell, we highly recommend them – going to stock up our next trip to Trader Joe’s! Comments Off on Chocolate Emergency!! Apparently, the Chocolate Manufacturers Association (members include Hershey’s and Nestle, etc.) are lobbying the FDA to change the legal definition of chocolate to let them substitute cheap vegetable oils for cocoa butter. BLEH!! Click here to read more about why this is happening and for easy links you can use to tell them what a BAD idea this is! John and I found a terrific store that sells only organic, fair trade chocolate products! We got a bit of this and a bit of that from the chocolate catalog at Sweet Earth Chocolates to try them out. Like bars of bittersweet chocolate, organic cocoa, and real peanut butter cups! They were all fabulous, and not as pricey as I’ve seen in other retail shops online. 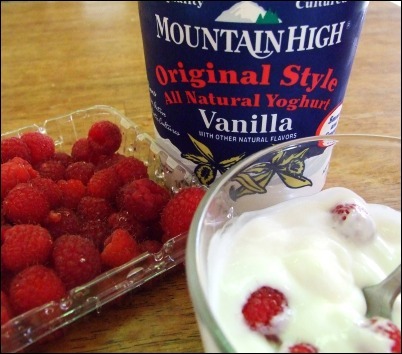 (I don’t even know where we’d begin to look for this type of product locally!) I also made delicious chocolate chip cookies with their chocolate chips, although they were so big that I had to snap them in half, which turned the cookies into chocolate CHUNK cookies – still delicious though – LOL. So if you want to feel even BETTER when you eat chocolate, check out the wonders at Sweet Earth Chocolates. We didn’t make these cream puffs, John just bought them at a supermarket bakery, but they were such a lovely surprise, and quite funny photographically, so I thought I’d post a photo. Maybe one of you readers will get inspired to make some of your own – if you do, let me know – LOL! We ambled into the local Kmart the other day only to run into a huge selection of HALLOWEEN candy! Is it always out this early or is time just running MUCH faster now? Anyway, although I couldn’t find any of my favorites (Milky Way Midnights – those tend to be rather rare in our area for some reason) we did find a bag of Dark Chocolate M&Ms! I wonder when purple became the American chocolate industry standard for identifying chocolate as dark? Comments Off on Delicious Souvenirs! From left to right: Eiffel Tower keychain (a must-have souvenir, of course), Bouquet garni (seasoning pouches for sauces), Edmond Fallot White Wine Vinegar with Herbs from Provence, a jar of rum-soaked crepes, Apricot & Almond Milk Confiture, Michel Cluizel Noir Infini 99% (now THAT is DARK chocolate – we’ve been warned to let it melt in the mouth but do NOT bite down, or we may die right there), and Lindt 85% Cacao Dark Chocolate (for those times when 99% might be a BIT too much.) 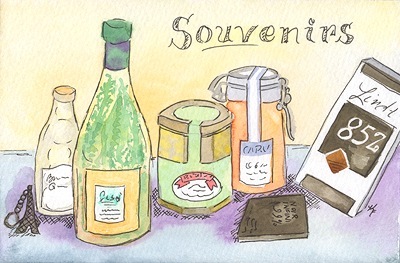 Mmmmm… souvenirs!